She has become a dominant personality in the field of entertaining since the catchy look which can attract all the crowd at her and the sheer smile and the locution which explicate her humility. She is well known Nirosha Perera in her name and the elder sister of Irosha Perera who presents "Iroshai Niroshai", the very famous TV segment on Sirasa TV on Sundays at 9.00am. Nirosha is the middle one of her family. 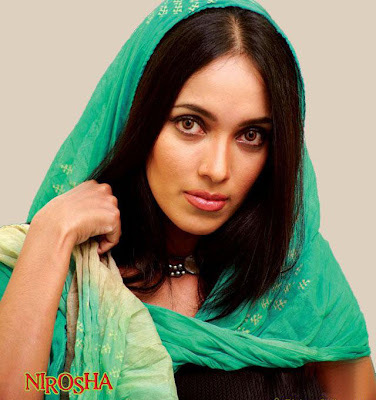 Nirosha's elder sister Nilushi Perera acted in a tele drama several years ago but now she is married and settled down. Presently Nirosha lives in her sweet home at Depanama, Pannipitiya. Both Nirosha Perera and her younger sister Irosha Perera studied at Buddhist Ladies College, Colombo. These two characters were very famous even when they were little school girls because of the true talents that they blazed. Nirosha was the first in almost all the activities in her school. What ever it is she blazed like a fire since her multi-talented nature. Nirosha was offered various opportunities during she was schooling but she missed them because of her least interest of acting and presenting. After her O levels she turned up on a cover page which was photographed by Pavara Sujith and costumed by Nilhan Seneviratne. Then a producer of Swarnawahini who had seen the cover page, has invited her to present her maiden segment "Wega Gee". After "Wega Gee" she presented "Swarnodaya" and "Live in Concert" on Swarnawahini. Meanwhile she prepared for her A level exam. After Nirosha finished presenting on Swarnawahini she started working at Taj Samudra as a Public Relations Executive. Then she was invited for a TV show named "Fun Time TV" on Rupavahini. Since that TV program was on Sundays she gave them the green light without any hesitation. Thence she started presenting "Rasata Rasak" and "Nethra" on Sirasa TV and now "Iroshai Niroshai" with her younger sister Irosha Perera. And she has also contributed to several teledramas and movies.